The Netgear XS716E provides 16 (sixteen) 10-Gigabit Copper ports and 1 Shared (Combo) Copper/SFP+ fiber port. 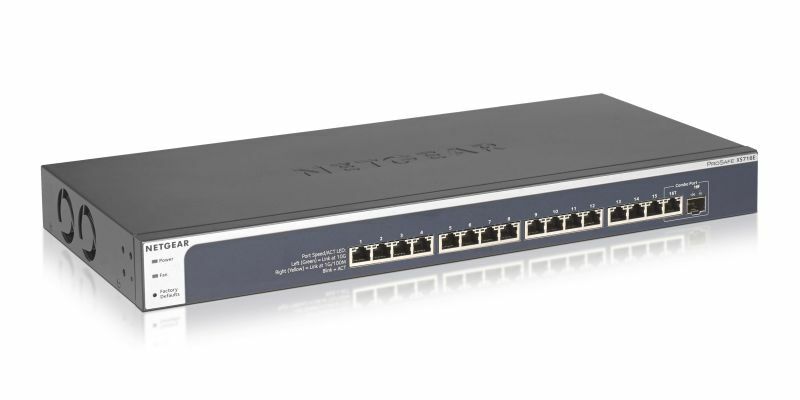 The Netgear XS716E can be used at the centre of a small business or home office network or as an aggregation/access switch in a larger organization including workgroup access, connecting to a Netgear ProSAFE 10-Gigabit Fully Managed Switch on one end and extending the 10G connections to the edge. 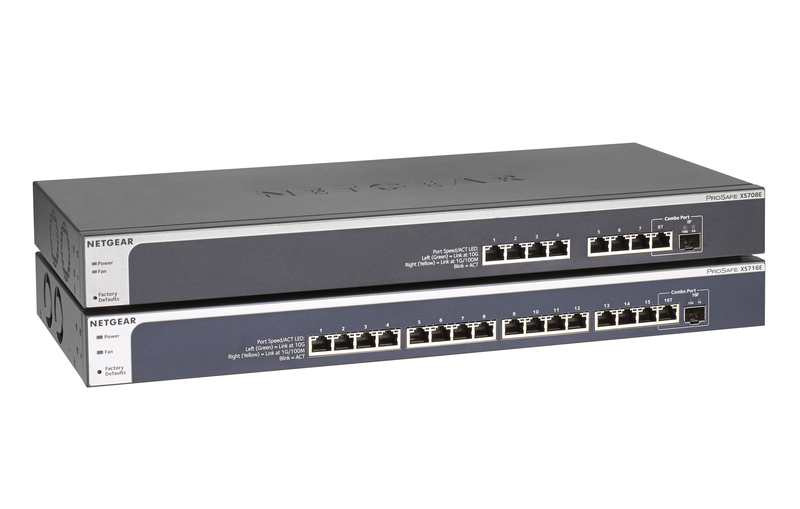 The Netgear XS716E 10-Gigabit Web Managed (Plus) switch is also ideal for smaller workgroups that need high bandwidth for sharing, collaborating, editing, and publishing high-density content like video or animation. As part of the ProSAFE Web Managed (Plus) switch product family, the Netgear XS716E comes with configurable L2 network features such as VLAN, QoS, IGMP snooping, port trunking and rate limiting. These features help to further optimize business network performance, delivering great value and empowering the SMB network. Sixteen (16) 10-Gigabit Ethernet RJ45 copper ports, one (1) 10GbE SFP+ port. Advanced VLAN support for traffic segmentation including port-based and 802.1Q-based. Advanced QoS (Quality of Service) for traffic prioritization including port-based and 802.1p/DSCP-based. CAT5/CAT5e are supported for Gigabit speeds only, up to 100 meters. CAT6 twisted pair copper cabling supports 10-Gigabit speeds up to 45 meters. 10G connection to 10G-capable servers and network storage. L2 configurable features make them the most cost-effective core switches SMB and home office/business environments. Easy-to-use web-based management GUI makes setup and management simple. 10-Gigabit Ethernet reduces cabling complexity and uses existing cabling efficiently.